Officially Licensed U.S. Army Bully Assisted Opening Tanto Pocket Knife Green | BUDK.com - Knives & Swords At The Lowest Prices! 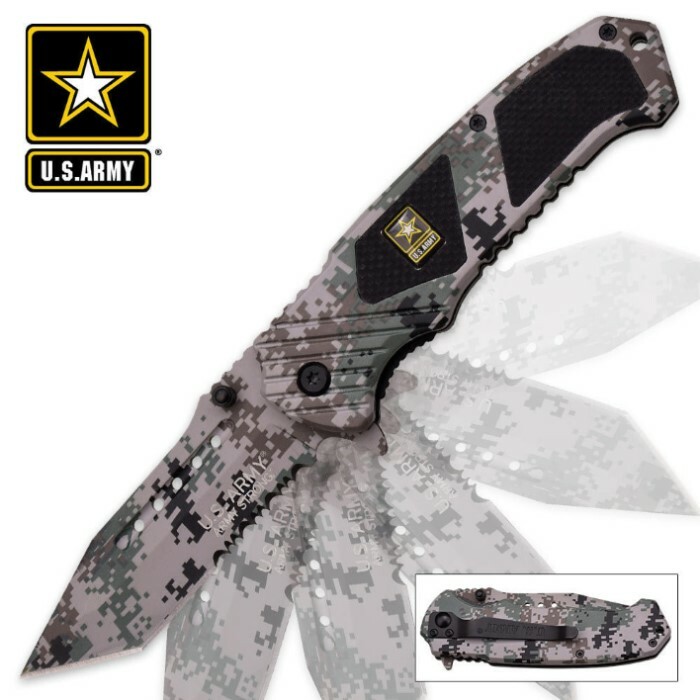 Bully your way through any sticky situation with this assisted-opening Bully pocket knife, officially licensed by the U.S. Army. This folding pocket knife features a 3-1/2" partially serrated stainless steel tanto point blade with a green digital camouflage finish. The sharp edge and piercing tanto point will do some serious damage, and the rugged G-10 handle inserts provide a secure, slip-free grip you can count on. A sturdy liner lock mechanism locks the blade securely into the open position, and the assisted-opening mechanism and blade spur provide fast, one-hand access to the blade. Clip it to your pocket, belt loop or backpack with the built-in pocket clip.